Sara Freeland, public relations coordinator, and Matt Chambers, reporter, work for the News Service at the University of Georgia (@universityofga). How do you welcome 35,000 Instagram-addicted students back to campus? 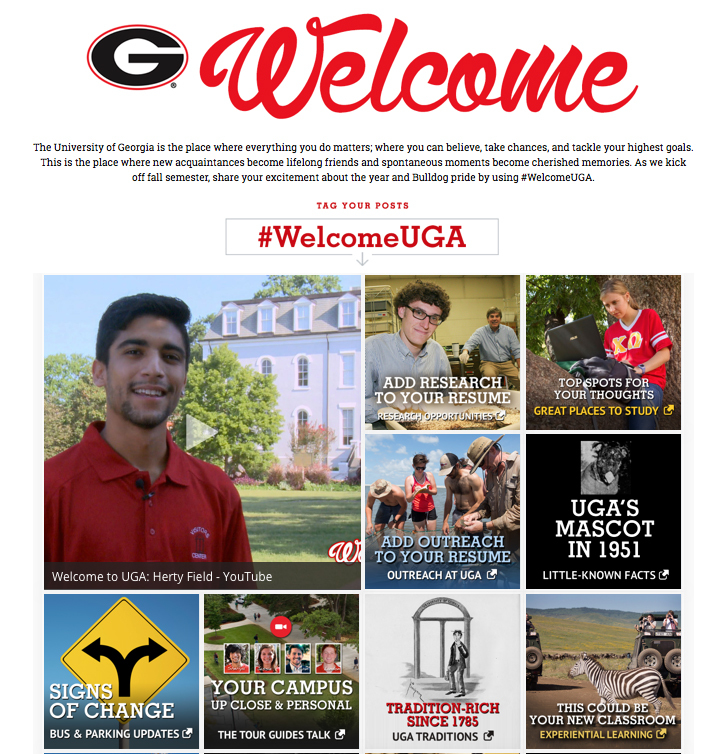 At the University of Georgia, we experimented with our first digital welcome campaign complete with brand messaging, stories, lists, videos, GIFs and aggregated social content. 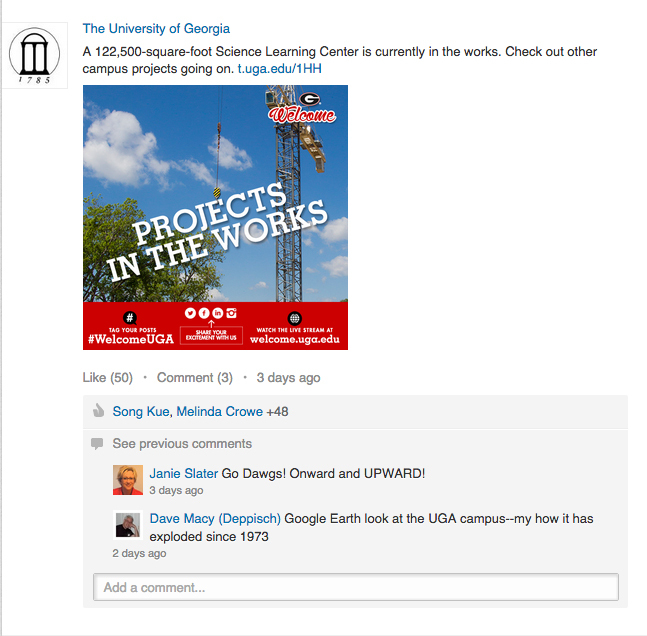 The focal point of the two-week campaign was http://welcome.uga.edu, which has more than 20 pieces of content and a social media aggregator pulling from #WelcomeUGA. The created content included 16 lists, four videos and three traditionally written stories. More content was added throughout welcome activities and the first day of classes. Overall, the purpose of this campaign was to increase understanding and pride in the university among students, both new and returning. This campaign was a fun way to play with story forms—other than the traditional press release. Since students are the focus, the tone is less formal and the storytelling more creative and colorful. We made Buzzfeed-style lists of fun facts, campus traditions, research opportunities, campus landmarks, places to study, hidden gems on campus and more. This was the first time we had really ventured into lists, which we wanted to be be useful, yet relatable—something the students could smile at and heart on Instagram. We also made interactive maps of construction and parking changes on campus with KnightLab’s StoryMap. The maps are responsive and swipeable on mobile devices. They’re also fun to scroll through and allow users to zip around campus, virtually. We really wanted story to have a prominent voice in the welcome campaign. 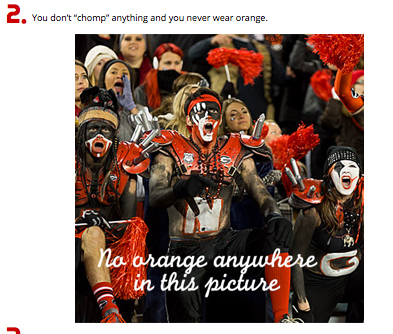 We wanted students to celebrate UGA and our campus. 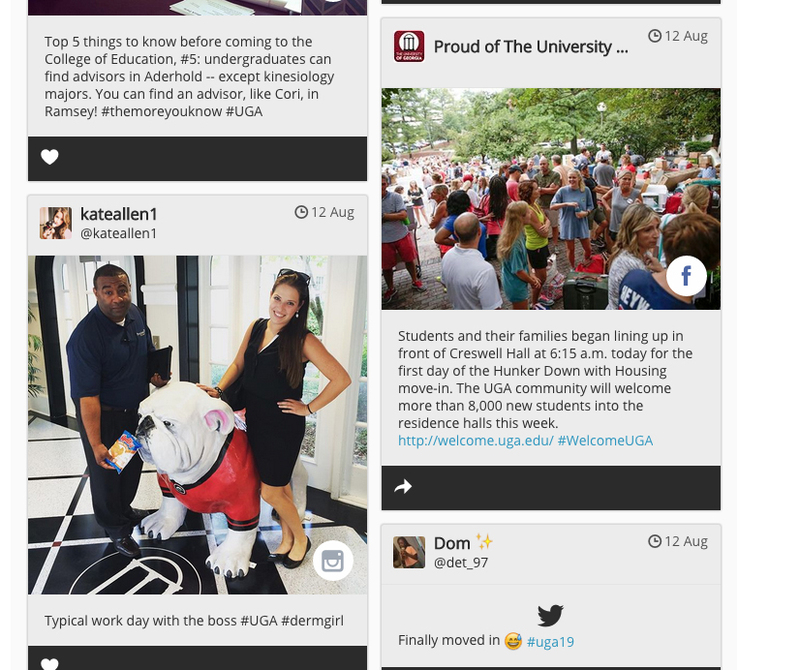 By aggregating social posts and photos from around campus—from selfies with new roommates to snaps of red and black dorm décor—we included the unfiltered student experience. We had UGA students star in videos about campus history, share their stories about study abroad or even talk about their favorite places to grab pizza or coffee on campus. We also included videos of students (and their tearful parents) on the first day of move-in. A piece on the first day of class also offered another look at what it means to be a Dawg. The landing page uses the collage widget from Wayin. We injected our own graphics—which linked to inside article/list landing pages—into the widget so we could be flexible, updating the arrangement or content on the fly. This allowed us to swap pieces in and out, adjust layouts and highlight certain things without having to worry about updating the site itself. We started the initial push on the first day of move-in—a week before fall classes started. On the first day of school, we sent a welcome message from the UGA president to the entire campus community. Internally, this campaign came together in five weeks. Our project manager, Matt Chambers, oversaw the content coming from a dozen staffers including photographers, videographers, designers and writers. As soon as it launched, we knew we had something special. Students chimed in and picked up on the hashtags, alumni reminisced about their days on campus and even our seasoned campus communicators raved about the site and its content, admitting they actually learned new things—like that our first mascot was a goat. The lesson we learned from this project was: An old Dawg can learn new tricks. Moving forward we’re embracing technology—setting up lunch-and-learns about adding GIFs to Instagram and making interactive maps. We’re already looking forward to next year’s campaign. Snapchat scavenger hunt anyone?